I’m an oatmeal cookie naturalist. There is absolutely no reason to add raisins, chocolate or anything else you can think of to an oatmeal cookie. It’s quite delicious on its own. Luckily for me, Tom agrees. At the absolute most, I guess I could understand adding honey or cinnamon to give them more of a granola flavor, but I still believe the best oatmeal cookie is a plain oatmeal cookie. 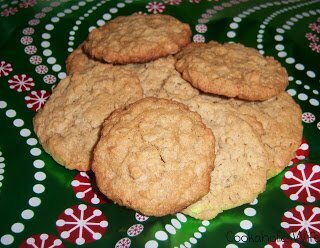 I don’t have some super-secret oatmeal cookie recipe either. I’ve always just made whatever recipe came on the container of oatmeal and omitted any additions. I did the same for this recipe. 1. Preheat the oven to 375. Line two baking sheets with parchment paper or silpats. 2. In a large bowl, combine the flour, baking soda and salt together. 3. In the bowl of your stand mixer with the paddle attachment, add the sugar, light brown sugar and shortening. Mix together until light and fluffy. Add the eggs, one at a time until completely incorporated. 4. Add the milk and vanilla. Slowly pour the flour mixture into the wet mixture. Once combined, add in the oats, one cup at a time until fully incorporated. 5. Drop rounded tablespoon sized pieces of dough onto the baking sheets, leaving about 2” inches of space between each cookie. Bake for 13–15 minutes or until lightly golden. 6. Transfer to a wire rack to finish cooling. Are you one of those people who swears by your silpat? I am, especially when it comes to baking. My first baking sheet of these cookies didn’t go onto a silpat and they burned somewhere around 7 minutes. My second cookie sheet, which had a silpat, and was on the same oven rack as the first, was perfectly done in 14 minutes. So I’d definitely advise using one or parchment paper to make these cookies. As an oatmeal cookie naturalist, these were great. They had just enough crunch and oatmeal flavor!